The F-16 Fighting Falcon is one of the most successful fighter jets in the sky at this moment. Production started 40 years ago with the F-16 as a air superiority fighter. Through the years F-16's where modernized and quipped with electronics, sensors and other improvements making it an all round fighter craft. The latest versions build are F-16E/F or block 52 versions which differ from other versions because of their externally mounted fuel tanks on the upper half of the fuselage. 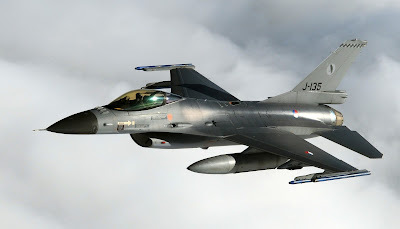 F-16 purchased in the seventies are often upgraded as well so an aircraft that looks as an F-16A on the outside can have the same specifications as an later build F-16C. The A/C/E versions are single seaters, the B/D/F versions double seaters. 4.500 F-16's have been build and it is only after 4 decades that they are slowly replaced by the Eurofighter or F-35 while other countries purchase new build versions. 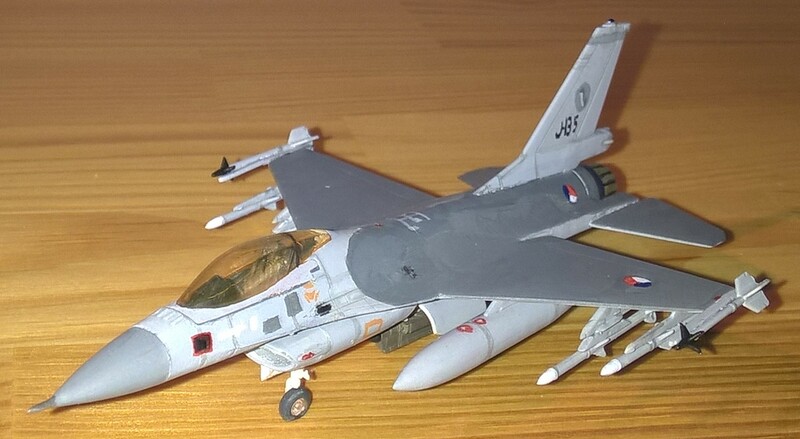 In 1/144 scale several manufactures make an F-16 model. Trumpeter being the only one with a double seated version. Revell currently has 2 F-16 model in production at this moment. The F-16A (Kit no. 03971) and the F-16C (Kit no. 03992). 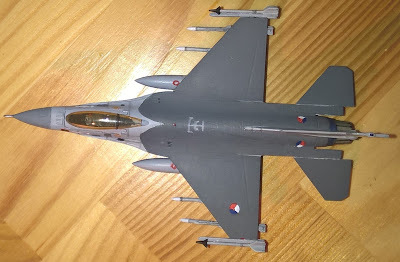 The F-16C box has all the parts needed to build an A version however. 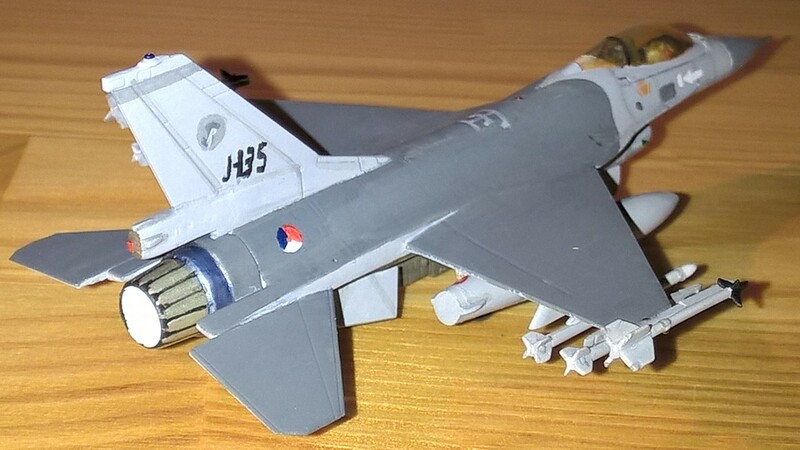 I made a Dutch F-16. Internally these are all upgraded to the block 50 standard but are indistinguishable from an A version on the outside. The model had about 30 parts, is easy to build and has very good detail. The fuel tanks have a few raised panel lines which it sanded away because they are over scaled. The ECM pod is from the Dragon A-10 kit because the Revell version has no detail at all. 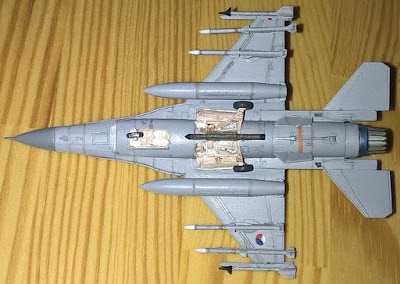 I left the jet exhaust part off until the model was fully painted. This part is very well done, in older models the jet exhaust is often one of the less well done pieces of aircraft and a not so realistic part of the model. No such weak points here. 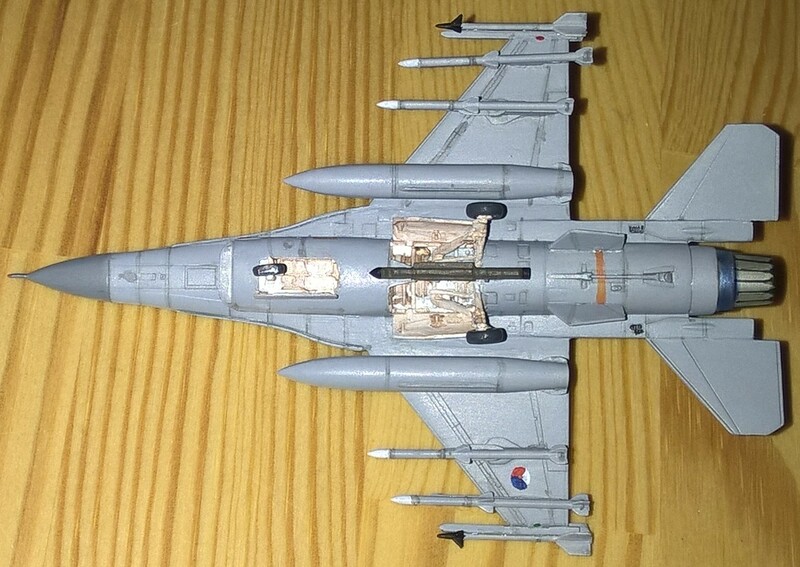 Contrary to the (first) release of their F-15E this model comes with 2 full sets of both Air to Ground and Air to Air weapons. For the colors I mainly looked at photo graphs. The model doesn't come with decals for a dutch version so I painted these myself. To create the titanium color of the exhaust i mixed Revells Aqua colors 'silver metalic' 036190 with 'sandy yellow 036166'. The cockpit canopy was painted with a highly diluted 'orange clear 036730'. Highly recommended, this backbone from many air forces can't be missing from any modern aircraft collection. Great to see such a large selection of ordinance included with this model.